Missing Teeth? Replace Your Teeth and Smile with the Next Best Thing to Natural Teeth . . . Dental Implants! Life, age, decay and accidents can wreak havoc on your teeth, gums and smile. Fortunately with today’s modern restorative dentistry procedures and materials you can restore your missing, decayed, fractured, cracked, chipped or discolored teeth so your smile looks like new again. With reconstructive dentistry, you’ll get a completely natural-looking “smile makeover” and nobody will ever know you had missing or badly damaged teeth! Providing you with a beautiful bright-white natural-looking smile that make you look great and provide you with self-confidence in social settings! 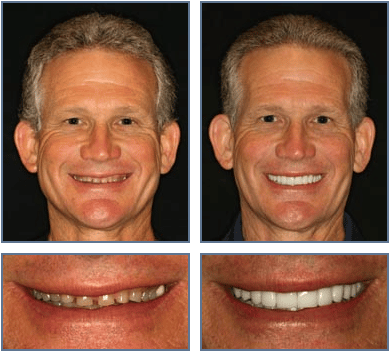 Browse our Smile Gallery to see the before and after pictures of our patients who have had their teeth and smiles reconstructed. You will see for yourself that their “smile makeovers” have provided dramatic transformations in their smile and their overall appearance! We’re sure you’ll find a case that resembles your own! Reconstructive dentistry is the process of reconstructing your teeth, gums, jaw (or any combination of these) to restore your missing, decayed, fractured, cracked, chipped or discolored teeth to look and function like new again. Reconstructive dentistry can involve the construction of new teeth with composite materials (such as porcelain), using dental implants where teeth are missing, installing or repairing dental bridges and other dental procedures. Reconstructive dentistry can include a longer timeline to complete than cosmetic dentistry and is usually performed under conscious sedation to ease your fears and ensure you are comfortable during the procedure. Our state-of-the art K-7 computerized mandibular scanning unit and sonograph are used to develop 3D images of your jaw and mouth and analyze your jaw muscles to identify your teeth and jaw’s ideal position. This ensures that your teeth and jaw will be precisely aligned for an attractive smile, proper bite and speech, and to ensure your jaw muscles are working properly to avoid the possibility of TMJ pain. The end result is a completely natural-looking smile makeover and nobody will ever know you had missing or badly damaged teeth! 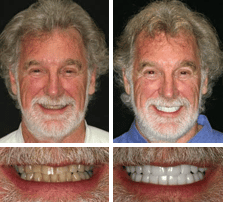 Immediate and dramatic results that will improve your smile. Visit our Smile Gallery to see how Smile Makeovers are transforming the smiles of our patients and how we can improve your smile too! 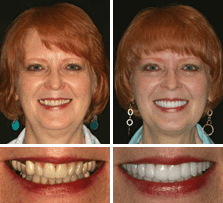 A stunning new smile that will look great and make you feel more confident in business and social settings! 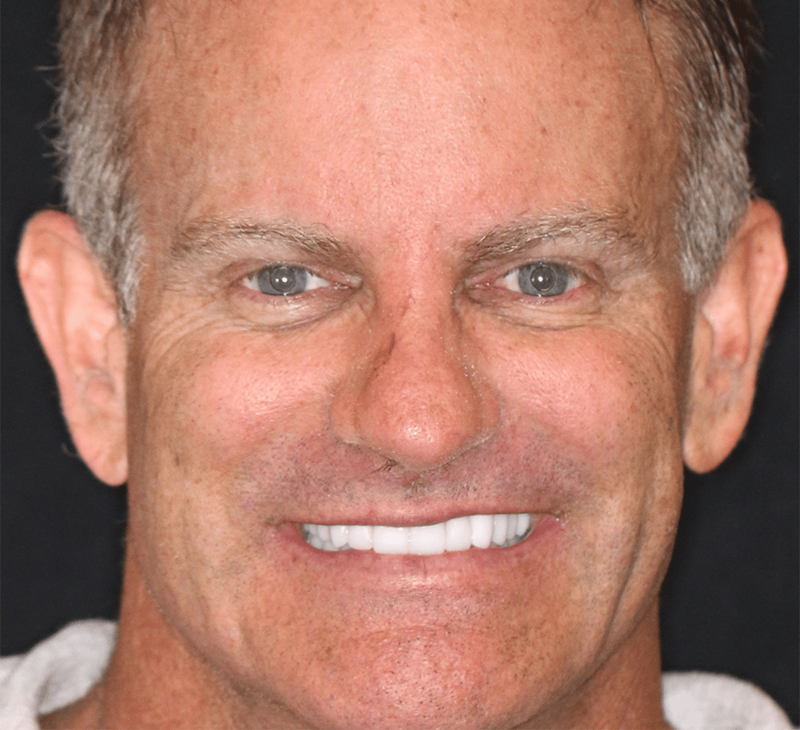 Experience Matters – Dr. Schiro and his team have over 40 years combined experience in cosmetic dentistry and have completed thousands of smile makeovers! 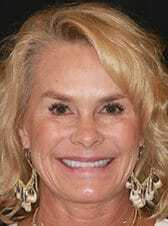 Clients from Texas, the United States and around the World choose The Cosmetic Dentists of Austin for their Smile Makeovers. 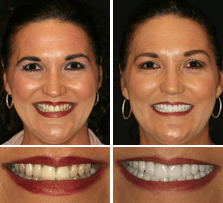 Our experience means we complete your smile makeover correctly the first time without any hassles or disappointments. Express cosmetic cases completed in as little as four days. Sedation dentistry options to ease your fears and anxiety. Our advanced sedation dentistry allows you to relax and drift away while we complete your treatment. Full mouth reconstruction utilizing advanced K-7 technology to assure the restoration of optimal jaw alignment. Easy financing to ensure your smile makeover is affordable. Full protection of your investment with our Last Time You Pay policy. Convenient appointments during weekdays and even Saturday. Complimentary limousine service for our out-of-town guests. What are the Costs of a Full-Mouth Reconstruction? The Cosmetic Dentists of Austin offer competitive fees in reconstructive dentistry. Our prices are affordable and our financing options will help you get the smile of your dreams right away . . . without hurting your budget! Plus, our exclusive “Last Time You Pay” policy protects your investment.